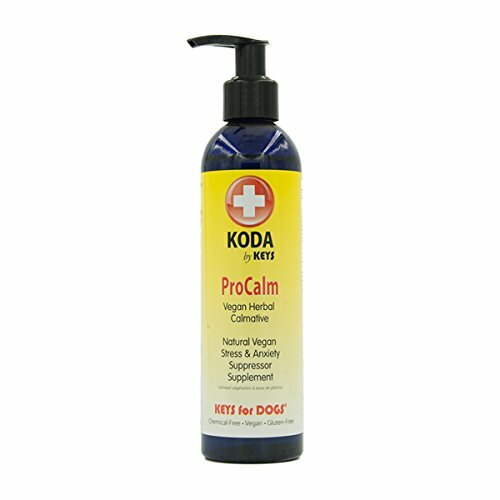 Procalm is a relaxing elixir developed for higher stressed and easily agitated dogs. it uses a combination of magnolia extract which is 90-percent honokiol and magnolo and virgin organic avocado oil as a natural herbal relaxer. add to food to reduce agitation and to help dogs remain sleeping through the night. the stress in our everyday lives continues to increase. this stress we feel is manifested onto our pets. the millennial relationship we have with dogs has drawn us closer together in lifeform. it is easy to project our stress on our pets and dogs receive it with great impact. many stomach, travel and skin disorders can be traced back to our dog's stress levels. over the years, there have been botanical essences that worked well. these have fallen short in recent years because stress levels in dogs can out strip the operating capability of these products. some people have turned to over-the-counter medications like benadryl to kick up the efficacy of stress reduction. although t.
If you have any questions about this product by Koda, contact us by completing and submitting the form below. If you are looking for a specif part number, please include it with your message. Dr. Goodpet Calm Stress - All Natural Advanced Homeopathic Formula - Safe & Effective Treatment for Hyperactivity & Anxiety!